Oh boy. What I do next I take no pleasure in. 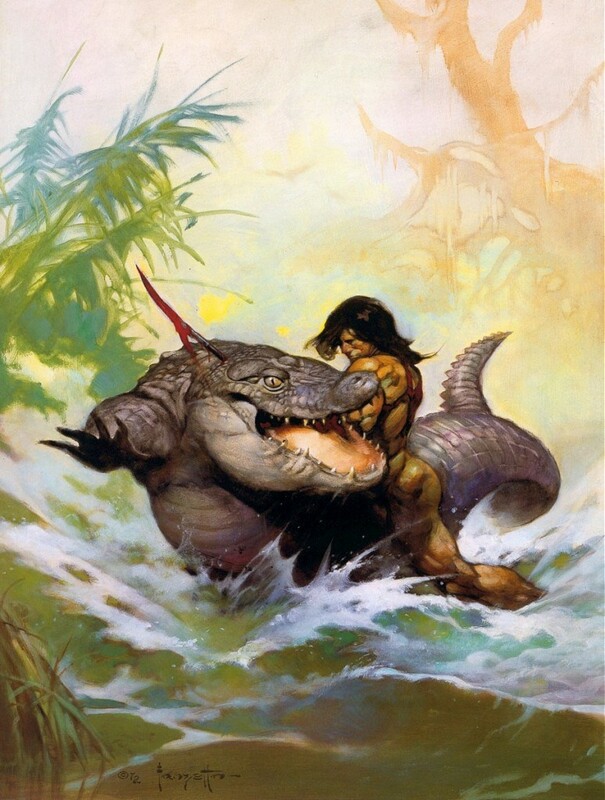 I want to like Edgar Rice Burroughs novels. Sometimes it’s fun to shred up a terrible movie or book, and sometimes it’s simply the easier analytical path. But kicking writers you love when they’re down … that feels ugly. If you’ve never read an Edgar Rice Burroughs novel before, maybe go try this, or this, or how about this, and skip what I’ve written below. Seriously, I would never, ever, want to discourage someone from reading the works of one of the twentieth century’s great imaginative spinners of tales. For those of you sticking around, hey, thanks plenty for wanting to read my analyses of ERB. 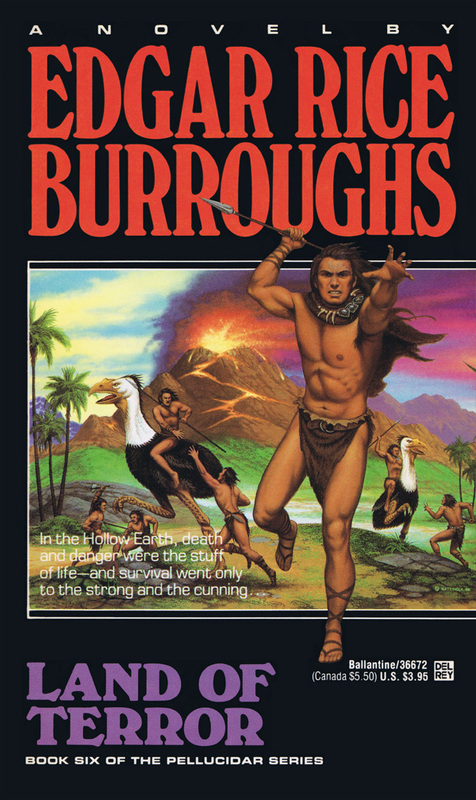 Whenever we want to feel good about Edgar Rice Burroughs, we have a dozen or so classics we can pick up and — bam! — transported to wondrous realms of infinite adventure. So after reading this article, I recommend you pick one of your personal favorite Burroughs novels. I’m feeling the urge to return to The Land That Time Forgot. I adore that book, and I haven’t read it in a few years. Our Saga: Beneath our feet lies a realm beyond the most vivid daydreams of the fantastic … Pellucidar. A subterranean world formed along the concave curve inside the earth’s crust, surrounding an eternally stationary sun that eliminates the concept of time. 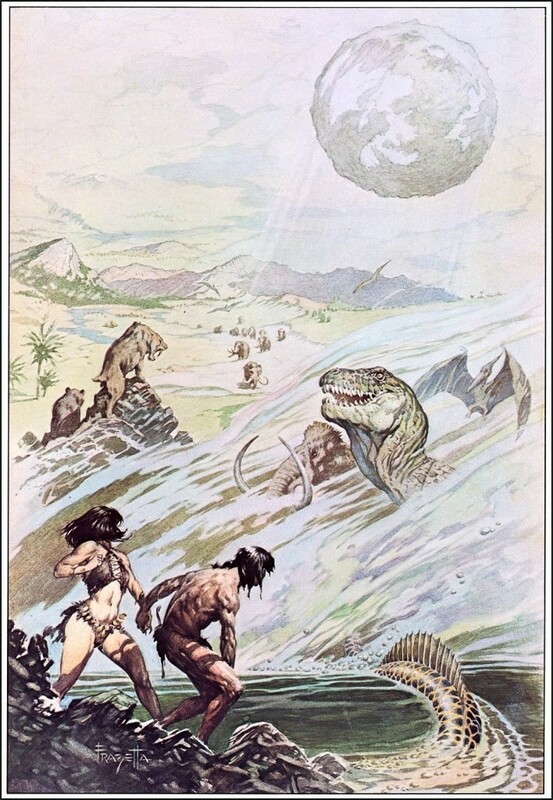 A land of savage humanoids, fierce beasts, and reptilian overlords, Pellucidar is the weird stage for adventurers from the topside layer — including a certain Lord Greystoke. The series consists of six novels, one which crosses over with the Tarzan series, plus a volume of linked novellas, published between 1914 and 1963. From the start of his professional career, Edgar Rice Burroughs was a highly salable writer. He sold his first novel, A Princess of Mars, to one of the biggest contemporary fiction magazines and had little trouble selling anything he put on the market after that. He hit a few bumps along the road when a reliable publication would reject one of his manuscripts (such as Munsey Magazines’ lunatic decision to refuse the second Tarzan book), and with some later works ERB had to try a few different markets before making a sale. But he enjoyed almost two decades of success with the top tier of the pulp magazines. Then Land of Terror came along and Burroughs confronted a shocking problem: nobody wanted to buy it. His success at making fast magazine sales began to slip in the late 1930s, which was partially because of a staleness in ERB’s style and subject matter, but also the fault of a shift in the pulp market that was now competing with the titanic success of comic books. However, the reception of the manuscript for Burroughs’s sixth inner earth novel was a stark sign something had gone significantly wrong. Burroughs wrote Land of Terror from fall to spring of 1938–1939. He sent it first to Argosy, where it was rejected with a letter listing all the faults the editor found with it: repetitive, unoriginal, sloppy. Burroughs wrote back agreeing with most of the points. He then made an offer to do something he’d outright refused to do in 1912 with The Outlaw of Torn: sell the idea to Argosy and let an in-house editor re-write it. Argosy still wasn’t interested. The manuscript went to Blue Book, Thrilling Wonder Stories, and the Ziff-Davis magazine group. Everybody said “no.” Burroughs’s self-confidence took a massive hit, and Land of Terror never made a magazine appearance — one of the few Burroughs novels to skip the pulps entirely. 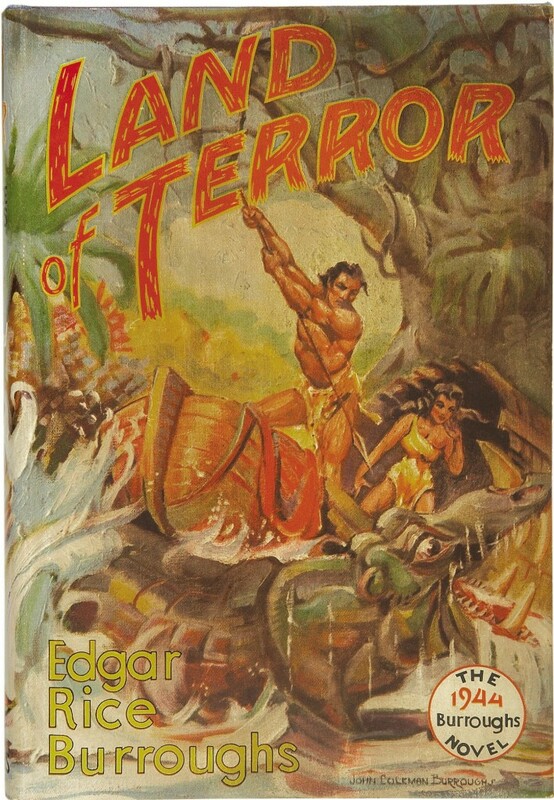 Land of Terror was finally published in 1944 in hardcover from ERB Inc. with a dust jacket illustration from John Coleman Burroughs. We pick up right after the conclusion of the previous book, meaning this is the fourth consecutive Pellucidar novel with contiguous action — although it doesn’t feel like it. David Innes, our main hero and narrator for the first time since 1915, recollects his time with Abner Perry in Pellucidar, where they’ve barely aged at all despite more than three and a half decades passing on the Earth’s surface. David Innes then tells the tale of what happened to him on the journey back from locating Wilhelm von Horst in Lo-har. It’s a narrative of a series of captures and escapes as David attempts to find a way to determine directions so he can get back to Sari. First, David falls into the hands of the people of Oog, a tribe dominated by burly bearded women who rule over submissive men. Next he travels to the Valley of Jukan, which is filled with insane people, and becomes the captive of King Meeza. Then he’s seized by the giant man-eaters of Azar, and escapes only to be captured by humungous ants. After getting free from the ant hill, David ends up on the floating Island of Ruva and its slave-owning society. He makes a last escape, encounters a friendly ship from Mezop that’s searching for him, and the story ends. David’s mate Dian is mixed up in all this, pursued by a man from Suvi named Do-gad who wants to force her to marry him. David allies with a man from Zoram, Zor, and a woman from Suvi, Kleeto. He meets, befriends, and is betrayed by U-Van of Ruva, who wants to claim David as his slave to raise his status among his people. A mastodon named Old Maj lends David and his friends help when they’re in a bind. There’s another girl from Suvi, Lu-Bra, whom David frees from enslavement. I could try to explain how these people weave into the events, but it’s easier to let you imagine it on your own. Plug in the names wherever you want (you can use them more than once) and you’ll be right. Or close enough, anyway. Burroughs never lost his knack for crafting interesting prologues and framing devices. The first chapter of Land of Terror is a throwback to David Innes and Abner Perry as we remember them from the first two novels. The rest of the book should’ve stayed in this humorous vein and attempted to recapture the spirit of exploration from those golden days, rather than lapse into the format Burroughs used through most of the 1930s. It’s a funny chapter as well, with ERB in sly satirical mode. David smirks about how Perry is developing civilization by finding better ways to kill people: “[The Pellucidarians] used to kill each other with stone hatchets and stone-shod spears … we have taught them how to make gunpowder and rifles and cannons, and they are commencing to realize the advantages of civilization.” As David departs, Perry is working on poison gas. I’d like to see how that goes. I’ll address this more below, but Land of Terror only hits the steepest downhill slide after David escapes from the ants. It’s not good before this point — with the exception of the prologue — but there’s a thin illusion the book may eventually blossom into something better. A reader can ride along for a bit and ignore the lack of direction while taking in interesting sights here and there. The culture of madness at Jukan has promise and contains dollops of humor. (Each person in Jukan knows everyone is insane while assuming they’re the only sane one.) The helpful mastodon Old Maj is a superficial re-write of the sidekick mammoth Old White from Back to the Stone Age, but at least it’s a re-write of something that worked. The section in the ant hill has pleasant horror flavoring. It’s not until moving into the second half that the flaws tear apart the thin curtain and reveal the whole book as a heap of zilch. Burroughs hasn’t completely lost his descriptive touch. He gives David Innes a few inner monologues about life in Pellucidar; there’s an excellent one at the start of Chapter XIX where he describes the eternal upward visual curve of Pellucidar and how it mentally affects him. It’s been ages since the horizonless appearance of the inner world was explored in detail. David also reflects on the insanity of the Jukans and wonders how a society can manage to squeak by despite full mental derangement. Too bad the book never goes deeper into this beyond David’s one bit of musing. I guess this is worth something: at 60,000 words, Land of Terror is shorter than Back to the Stone Age. [T]he development is distinctly haphazard, consisting as it does of little more than a series of escapes, captures and rescues. Too, the lack of a constant menace and of sustained suspense; the fact that David has almost no definite objective at the outset, and that later his whole aim is simply to get out of the trouble he has gotten aimlessly into; the abrupt appearance and disappearance of various more or less principal characters — all these only help to increase the disjointed effect of the narrative … Smaller touches and scenes are almost duplicates of similar situations from earlier Burroughs yarns published in Argosy. That’s as succinct a rundown of why Land of Terror fails as anything I could write, making me wonder why I’m even here. It’s spot-on in general about ERB’s late 1930s decline; I made many of the same criticisms about Back to the Stone Age. But that book still holds together with an adequate level of engagement and has some fun action. Land of Terror is the quintessence of these problems, with almost nothing to keep it together or any standout action. I didn’t seem to be able to do anything about it … I can’t read that statement without feeling immense sorrow and sympathy for one of my favorite writers. It’s fun to poke at Munsey’s Magazines rejecting The Return of Tarzan and initially refusing The Mucker; those are two of Burroughs’s finest achievements, and what type of brain-freeze caused the editors to miss that? But Land of Terror was rejected for the right reasons. It’s sad to admit that and then have the author sigh and agree. How did we end up here, a book so eventless in a series that started with the amazing At the Earth’s Core? See also Post’s remark that the development is “little more than a series of escapes, captures and rescues.” In short: there’s no story here. The book can be broken down into five unequal episodes that have no link to each other except enough geographical proximity for David Innes to wander to each one in succession. The gender-swap culture of Oog; the insane Valley of Jukan; the man-eaters of Azar; the giant ants; the floating island of Ruva. At any given point, David Innes only wants to escape — and not even urgently, which was also a problem with von Horst in Back to the Stone Age. There are allies he occasionally needs to rescue, but David rapidly forgets about them when they exit the story. He often forgets about Dian, whose presence in the book is so marginal that readers may also forget she’s out there. This connects to the problem of making David Innes the main character again. 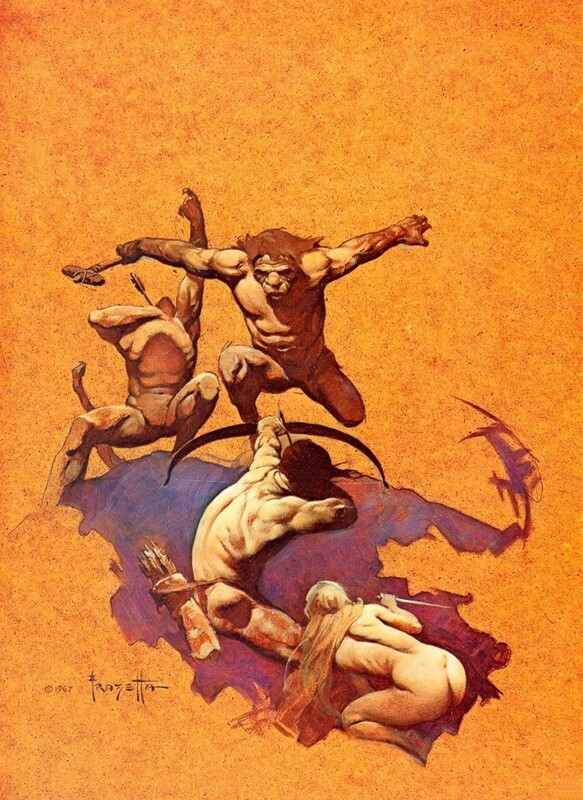 When Burroughs did a late-series return to John Carter as the lead in Swords of Mars, he provided his hero with a fresh adventure idea of traveling to the miniature world of one of Mars’s moons; otherwise there would be little drama for John Carter. But David Innes, who’s best fit for an adventure dealing with a direct threat to Sari, or possibly a new war with the Mahars, is trapped doing the Same Damn Thing as the previous Pellucidar books where he wasn’t the protagonist. This is the biggest aggravation in Land of Terror, and the reason David Innes can’t whip up an actual story for himself. Characters are “out of sight, out of mind,” no matter how important they may seem to the story. If even Dian can hardly manage to stay in the thoughts of the man who married her, figures like Zor and Kleeto haven’t a chance. This pair is set up as the co-hero and love interest, a tactic Burroughs often employed successfully when bringing along a main character who couldn’t develop his own love plot, like Tarzan or late-series John Carter. But Zor and Kleeto vanish after the short period among the man-eaters. David pushes both from his thoughts, and the book only returns to them in a mention in the last two sentences. David originally planned to have Kleeto serve as his human compass to guide him home, but swaps her out for another girl from Suvi, the late addition of Lu-Bra. Functionally, she’s the same as Kleeto. There are other characters who seem like they’re destined to play larger parts in the narrative, but then either die abruptly or fade into the storytelling ether. The Valley of Jukan offers potential villains such as Noak, the major-domo of the palace of King Meeza, and Meeza’s son Moko, who wants to marry the captive Dian. But both get killed in tensionless encounters only a few chapters after first appearing. David joins up with U-Val, an ally-turned-traitor, for the final quarter of the book among the Floating Islands (another interesting concept thrown away with a few sentences). But U-Val is an idiot whom David kills easily in a fight a few chapter too early. And that’s the final tally, isn’t it? Add up the loose episodes, the characters whose presence feels random, no villain who hangs around for more than a few chapters, and a hero without a goal, and you end up with a tensionless story that cannot sustain interest. This is the type of bad book where the badness creeps up on you. You trudge along with it, taking a look at the scenery and noticing bits of local color (Hey, giant ants! Warriors riding flightless birds! ), but then you stop, look around — and realize nothing has happened. The point where this struck me the hardest is when David is negotiating with the Ruvans about what technology he will or won’t build for them. The whole aimlessness of the endeavor (aimless is a word repeated over and over again in the book, as if Burroughs knew what was happening) crushed me. This was all going nowhere and none of the even modestly interesting ideas were being exploited. David Innes isn’t in serious jeopardy, he isn’t desperately trying to locate Dian or get anywhere, there’s no anxiety or tension — there’s hardly much of anything. And, by the Gods of Mars, the ending. This is arguably the worst conclusion to any Burroughs novel. David escapes from the island of Ruva with Lu-Bra to help guide him back toward Suvi and then on home to Sari, but this isn’t a climactic action beat. It’s simply the last action beat. Without doing anything, David runs into a rescue ship, and the story wraps up in a page with a report that Dian killed her pursuer Do-gad and got to safety, and other characters we’ve long forgotten about also got to safety. The action readers want to see occurs off-page and in spite of David Innes. He never even meets Do-gad, the man who’s kept his great love in captivity for much of the book. Post was also correct about the amount of concept recycling. Once more, we have a society based on a clumsy reversal of gender stereotypes — something Burroughs never made funny or satirical despite trying it repeatedly. The mastodons crashing through a log palisade to save the hero comes straight from the previous book, as does David rescuing a trapped pachyderm. The tusked men of Azar are almost exact duplicates of the Gorbuses from Back to the Stone Age. The island societies Ruva and Ko-va feel similar to much of the island-hopping in Tanar of Pellucidar. Even the giant ants are something Burroughs already visited in other books. 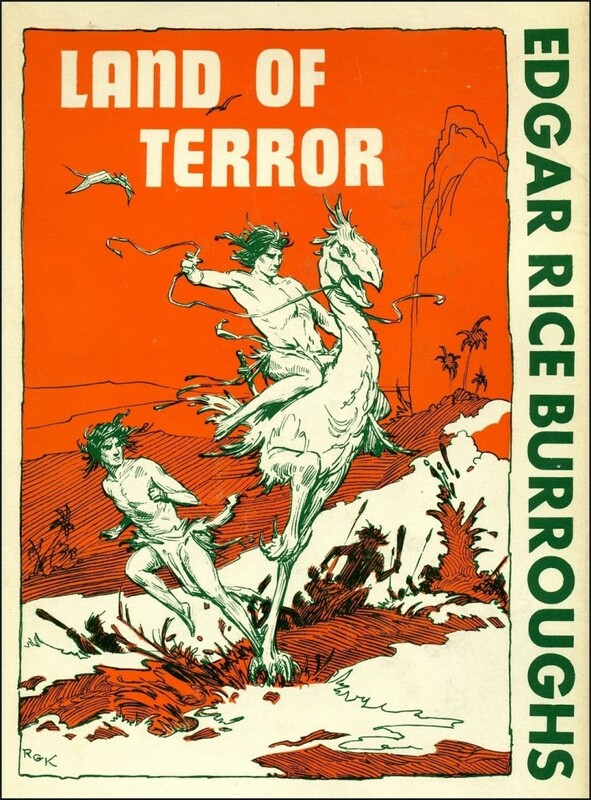 The ultimate source of the problems with Land of Terror is probably that Edgar Rice Burroughs was plain old exhausted. With a steady creative output of twenty-eight years, the grand storyteller finally collapsed into repetition without meaning. ERB often built stories on formula, but he could construct exciting variations and characters around his favorite pursuit narratives and generate a thrilling rise and fall of action that perpetually drove readers onward. Here, he has the formula and nothing else: a rehash of previous ideas, characters scattered everywhere without connection, and no dynamic rhythm. Look at the lazy way Dian is plunked into the story and her pursuer never ends up encountering the hero once. Even just ten years earlier, Burroughs would’ve made Do-gad central to the action and kept David Innes focused on hunting the man down and rescuing Dian. It isn’t fresh, but it’s something. When Burroughs says “I didn’t seem to be able to do anything about it” regarding the failures of Land of Terror that could’ve been fixed with a rewrite, I believe him. At this stage in his career, he’d become creatively paralyzed. And that’s tragic. “What are you going to do?” asked Zor. Most Inventive Idea: The insanity culture of the Valley of Jukan. Best Creature: The giant ant bear who intervenes to save David from the ants. Carson Napier Memorial Foolishness Award: That David Innes thought this story would be interesting to tell anyone. How about a sequel? No. Ed thinks this has gone too far and he’s not having fun anymore. Unfortunately, you’re right. The Pellucidar setting/series had so much potential. So much is THERE, obvious to readers, yet Burroughs slowly let it dribble away. ERB Inc. is starting to authorize some pastiches. Pellucidar is the one setting most in need of pastiches to correct some of the criminal neglect/lost opportunities, IMO. At least Ed rallied toward the end of his career. It’s always sad to read a Burroughs series and get to the point of the inevitable slide. The vast majority of my reading was in my pre-teens and thanks to mail order read most of the ACE reprints back to back. To be honest I’m not the typical Burroughs fan as I LIKE Carson Napier and kept those books after all these years along with The Mad King. The Pellucidar series was basically read all at once and I liked Tarzan at the Earth’s Core best along with -yes–Back to the Stone Age. I tended to be a sucker for the romance portions. Totally agree with oyu on Land of Terror. I just never warmed up to David Innes as a character and by then he was doing what you said going from escape to escape like Carson did in the last two books (Wizard of Venus was a huge let down-sigh). Savage Pellucidar was better but I got really tired of the Dolly Dorcas joke which I can’t wait to hear your review of. I have enjoyed immensely your reviews on Burroughs and looking forward to War Chief and Apache Devil-another favorite series. I believe I was the perfetc age for Burroughs back then as it led me to Rider Haggard and eventually Conan (with mixed reactions I preferred Solomon Kane) and Doc Save and the Shadow. Have sadly outgrown Doc but still love the Shadow. Thank you Major Wooten. It was a remark on a Ballentine paperback that Haggard was a writer that Burroughs admired that got me started and with a little help Classics Illustrated’s King Solomon’s Mines a 30 year search for all Allan Quatermain stories began. Magepa the Buck eluded me for years not knowing it published in Smith and the Pharoahs for a long time. By the way in my usual bad typing I meant to type Doc Savage. Favorite Allan novels are a tie between She and Allan and the Ivory Child-both have all the elemts of classic Haggard-lost tribes, magic which Allan always stubbornly explains away, whote Goddess figures, prophecy and the suual heartaches for Allan. Burroughs may have king of story telling but Haggard excelled in beauty of setting and grim forebodings. Yeah, I love Haggard and would enjoy seeing a reread of some of his stuff someday. He had one major advantage over Burroughs — he’d actually traveled to a lot of the places he wrote about.